Angioplasty is a term describing a procedure used to widen vessels narrowed by stenoses or occlusions. The process is very similar to an angiogram. Once the blood vessel is punctured, a guidewire is introduced and fluoroscopy is used to monitor small injections of contrast media (dye) used to visualize the path through the vessel. 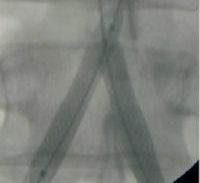 Having reached the area of stenosis or disease, the radiologist will inflate the balloon on the catheter that has been passed along the guidewire. Balloons are inflated in size and duration depending on the size and location of the vessel.